If you have ever thought about selling your precious metals, one of the things you may have wondered is: how are these transactions reported? When a client sells bullion to a precious metals broker, a Form 1099-B may be required depending on the type, fineness, and quantity of the bullion sold. If the bullion sold meets the requirements for reporting, the broker must complete and send to the IRS a 1099-B form detailing the transaction. If what you are selling does not fit the list above, the broker is not required to report the transaction. Please consult your tax advisor to find out your reporting responsibilities on other precious metal, bullion, or numismatic transactions. The information here is provided to educate and assist you and is not intended to give you tax advice in any shape or form. While a stricter interpretation of the regulations is possible, ICTA believes the above guidelines to be those which fulfill the spirit of ICTA’s negotiations with the IRS. Though the information provided herein is based on ICTA’s discussions with the Internal Revenue Service, others may differ with ICTA’s interpretations of these regulations. ICTA strongly cautions that alternative interpretations may not fulfill the requirements. 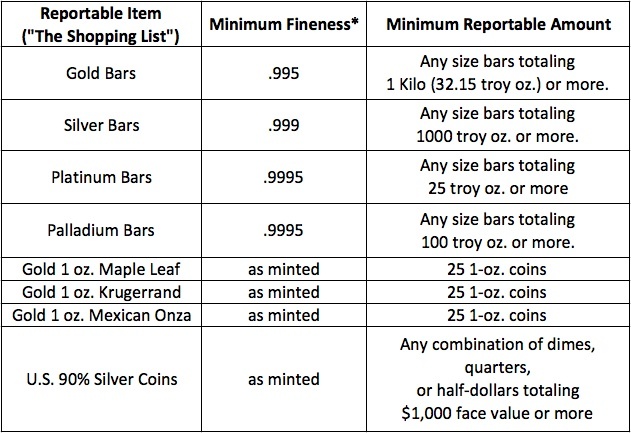 American Bullion Risk Disclosure: Purchasing precious metals in the form of bullion, bars, coins, proof coins, or numismatic coins involves a degree of risk and variable premiums that should be carefully evaluated prior to investing any funds. American Bullion and its agents are not registered or licensed by any government agencies and are not financial advisors or tax advisors. Past performance is not a guarantee of future results. Gold and other precious metals are considered long-term investments meant to be held for 5 to 10 years or more. This publication is meant as a resource and not intended to offer any financial or tax advice.